Clean Energy Connections provides NYC’s emerging cleantech sector with the network it needs to grow and compete in the global economy. NYC’s clean energy sector turns to Clean Energy Connections – a partnership of Solar One and NYC ACRE at NYU Poly – to share best practices and create new visions. The live discussion series, featuring thought leaders and innovators in the energy field, sparks dialogue on the state of the industry. Both physical and digital hubs connect the cleantech community to inspiring and highly relevant conversation in this evolving field. To view any of the following events, click here. 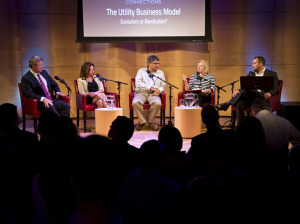 The Utility Business Model; Evolution or Revolution?